Hi everyone I’m starting with the tutorials of php here in a series, hope it help you guys, stay updates for a series of php tutorials. download 32bit version or 64bit according to your requirement. After installing you will get a shortcut on your desktop, start it by double clicking it you will get a wamp icon in your taskbar. >localhost – it will open the address of localhost in your web browser. >phpmyadmin – this is a installed alias which will help you manage your databases. >www directory – this is the directory where you will place you php files/projects to run. >apache – manages apache extensions. >php – manages php extensions. >mysql – manages mysql extensions. 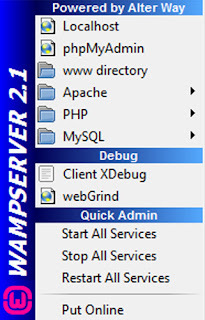 That was all about installing wamp server i.e setting up a localhost.